I agree with you. I have done research to see franchise QB numbers in their first 3 years and Dak numbers are just as good if not better in some cases. I have challenged any of the haters to prove it wrong but they can't. dallasdave, Jake, ufcrules1 and 1 other person like this. Adam was the best WR there as far as his hands go add his throwing skills, howd this guy fall out of the draft and into a UDFA to become one of the top WR in the league..that was impressive last night, he made those catches look easy when others struggled..yes some of those QBs had some major issues hitng any targets, wheres David Carr when we need him LMAO.. If you take most players’ stats after their first 48 games started, you’ll find that Dak’s stack up well so far. Looking forward to seeing how this plays out, and pulling for him to take it up a notch from here. The trajectory of his improvement compared to others will eventually tell the story. But if we go by the first 48 games, his start is solid. dallasdave and Irvin88_4life like this. dallasdave and DFWJC like this. Its not that Romo built up this legendary status. Its moreso that non-biased fans appreciated Romo back then and are forced to defend him now bc of sensitive Dak stans. Op was about Dak and the Pro Bowl, yet by the 3rd post, a Dak stan brings up (disses) Romo. Dak fans defense mechanism is always to diss past and current QBs to make their boy wonder look better. Gangsta Spanksta, Philmonroe and FTWayne like this. Wilson made that huge leap in his 4th year. Before then, his numbers were pretty similar to Dak’s. Anytime people put Daks name on the overall record since he's been here, mention HIS playoff wins and his RotY award it's only fair some put the blame on him. I thought he was average and I didn't blame him for the loss. Just like his career has been I feel we can win with average Dak as long as the other parts of the team are carrying/doing their job. Edit: This is also the reason why it's easy for me to accept another QB playing instead of paying Dak when it's time. Gangsta Spanksta, Philmonroe and WillieBeamen like this. My main point is that as much as some love and appreciate Romo now, he wouldn't have even been the Cowboys QB for as long as he was, if Jerry just listened to some Cowboys fans who wanted Romo gone. It was because of the Cowboys sticking with Romo that he developed into the great QB that he was and how we had good seasons with him. Very similar things are used to bring down Dak now. If Dak isn't the QB, then the Cowboys will eventually have to move on. But, he could still develop into a seasoned QB that a team can win with, whether that he with the Cowboys or another team. I'll admit that Dak Supporters will mention Romo and other QBs in defense of Dak. But, it also happens the other way around, where those who doubt Dak, will mention other QBs to elevate them and diminish Dak. This garbage thread has over 200 replies? Ouch! Nail on the head! You added to it when you could've just let it go so thanks for your contribution to the garbage. InTheZone and Irvin88_4life like this. Irvin88_4life and Philmonroe like this. Who is changing topics? I was talking about the Rams game where Dak scored half the points the opposing quarterback scored until the last six minutes of the game. A game that was more one sided than the scored showed since our defense toughened up and kept them to two field goals where instead it could've been 38-15. Any other games played are irrelevant to the argument that Dak did not do his part and score enough points in that game. You're the one who wants to distract from the topic that Dak was partly responsible for the loss against the Rams by bringing up games that Dak did not even play in. And way to put words into my mouth, saying that I said Dak was the sole responsible party for the loss. Yeah the defense didn't have a good day either, but that doesn't change the fact that on the offenses side of the game Dak was anemic when it came to scoring points needed, or throwing it deep enough when challenged to give the running game a chance. yeah, Dak looked better with 6 minutes remaining on the clock. Part of that is on him. But part of that is also that the Rams switched from playing to win the game to playing to keep from losing, in prevent mode, and basically it is what you call Garbage time when teams who were getting beat all day long finally make some garbage touchdowns. Sometimes teams pay for playing to keep from losing too, and the Rams almost payed for it. I've posted videos before too, but stop trying to play stupid here, the kind of videos you are asking my to post require a payed account where you can watch every play. and then I would have to make gifs to post them on here. That goes way beyond the videos you've posted here. 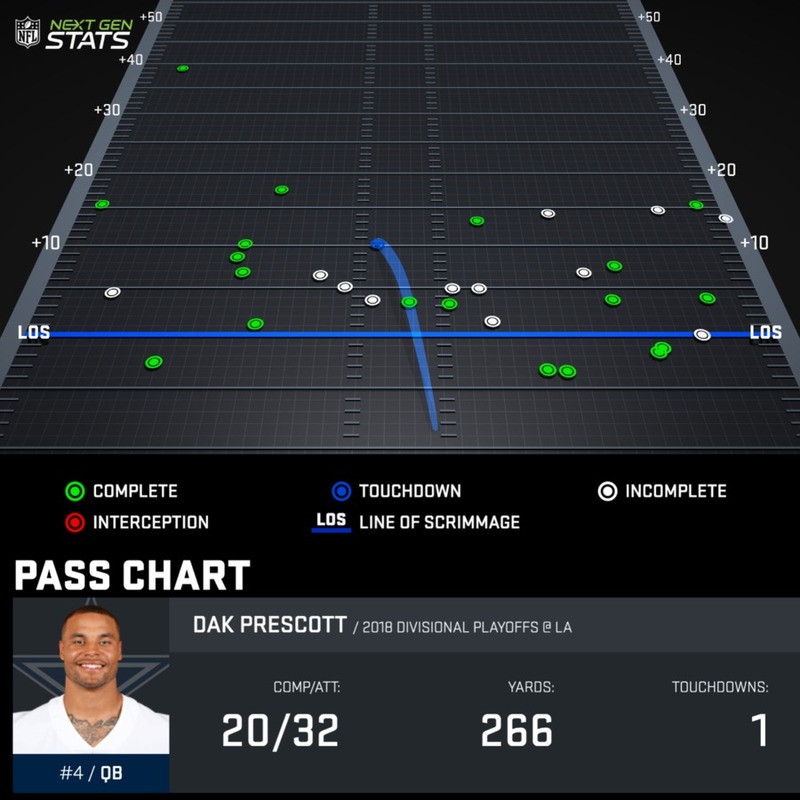 Anyway here's a dak chart for you. Is that a lot of passes thrown past the 15 yard line, especially when the Rams were selling out on the run? Thanks for adding to my garbage. Well Romo was brought up on this thread by the Dak supporters as a means to prop up Dak by putting down Romo. The simple truth is, Dak did not play well in the Divisional Game and Romo has nothing to do with it. People want to say that Romo ultimately failed, well fine then. He never got to the super bowl. But none of that has any bearing that Dak has some major flaws that teams are using to game plan against us. Hopefully, Dak can improve in the off season, and hopefully the coaching can find ways to make opposing cornerbacks not disrespect Dak. Scoring 15 points until the last 6 minutes of the Game, will usually lose you the game in today's high scoring NFL. So while it might be your opinion that Dak didn't lose us that game, that is all it is, an opinion versus the truth. Setting aside the fact that the Cowboys have never won a playoff game when allowing more than 28 points - Meredith, Staubach, Aikman, Romo, and Dak have all failed - blaming Dak for the Rams debacle is absurd. The Rams rushed for 273 yards. Show me a playoff game where a team rushed for over 250 yards and lost. Go ahead, I'll wait.